The Watier comes over to Indy to take is order. "I'll have a Water and the Filet Mignon please." He turned to his left and told Dug and Snow White his plan on how he didn't have to pay for any off it so always get the expensive thing. A few minutes after arriving, Vanellope sees Yensid come up and greet everyone. They are then taken inside and seated at a table. Yensid then gives out the news of where they will be going after lunch. Some ride called Soarin'. Vanellope was hoping it wouldn't be anything serious, but she knew that it probably was. She looks over the menu real quick, but she's not really sure what sushi is. She eventually settles on the Rainbow Roll, mostly because of the name. "Sumimasen. Watashi wa anata o kowagara serunodesu ka? Sore wa yoidesu.......watashi wa ebi tempura, yakiniku, yakitori, to udon, to yakisoba, to mitsu kobe beef steaki tabetai." OOC: I will set up the next death (which will NOT be at Tokyo Dining) when I get online tomorrow. The (un)lucky person will get a PM about his/her demise. For now, just follow along with the flow of the posting - which is dinner (and some fun chaos/interaction wouldn't come amiss). I also will start a new post count when I get online tomorrow as well. Mater: "YAAAAAAAUUUUEEEEEEE" Racing with his rockets through Epcot's test track attraction sure was fun. At the end of his 10th run, Mater realizes its time to meet everyone. He heads to the restaurant as everyone is beginning to sit down. He looks at the table and finds a space next to the small candy girl, Vanellope. As they look at the menu, Mater notices the restaurant has Wasabi. Mater turns to Vanellope and says: "That wasabi looks just like PISTACHIO ice cream." He says with enthusiasm. And Mater continues: "But its a trick. It tastes like "turned" pistachio ice cream." Mater laughs as he sees the look on Vanellope's face. She settles on some colorful food as Mater decides it would be best just to order some water. He did just have a good lunch with the other trucks after all. As the server leaves to fill everyone's orders Mater thinks to himself: "Shoot, I hope everything is ok at this new location. But dat gun!! Being a field detective is fuuuuun." "I'll have the sushi sampler and a miso soup, please." He remembers Dory. "Err sorry, nevermind about that sushi, just the soup and some tea please." Diablo returns from playing with the birds on the lake just in time to meet everyone for lunch. He taps a talon delicately on the menu to indicate his choice of sushi to the waiter. He looks around the table while waiting for his order, noting a bit warily that all the cats seem to have teamed up. That can't be good. He decides he'd better stay close to someone with thumbs. While making small talk with a friendly boy named Jim, Vidia makes her way to Tokyo Dining. Not hungry, Vidia takes a water. With the rest of the detectives seated a listening, Yen Sid asks them what they think of the case. Vidia listened intently, hoping someone would answer so it would get the ball rolling. Marie watched in horror as Scar plucked one of the koi from the water and ate it. As hungry as she was, Marie was a lady and would never steal a fish like that. As Yensid spoke and led the detectives into the restaurant, Marie made sure to stay close to her two new feline friends. She was really in the mood for a nice bowl of cream, but she settled on ordering a grilled chicken and a water. Si and Am watched the big cat eat his appetizer outside the Japanese restaurant Looking on with approval, Si started "Nice" "technique" finished Am. As the koi were too large for a single cat, the decided to go inside. They highly approved of the menu option, this was there type of restaurant. They wondered if a Cat owned this one too. As they waiter stopped by to take their order, "Sashimi Sample" said Si, "same for me" agreed Am. "and two saucer of cream" they said in unison. After a quick look round the shops she heads to the restaurant. Merryweather took her seat and perused the menu, "Dynamite Roll and Hot Green Tea please" turning to the waiter. Looking around at the assemble, in response to Yen Sid's question "Well, soup serving, sleep severing, space blasted and a watery grave, Angus isn't the only one off their head." As Abu enjoys his noodles he watches all the feline detectives gather around the pool with amusement. Of course, Scar swipes a koi and Abu just shakes his head. He follows the rest of the group inside once Yensid directs them to while Carpet waits outside. Once seated Abu looks at the menu but doesn't order as there are no pictures. Waving the waiter over, he points to a fake fruit display, then his mouth. The waiter bows politely and Abu hopes he was understood. "I will need one of these and two of those and maybe just a few of these." Parts begin to disappear from the exhibit as Doof plans his next Inator. Marie suddenly realized the two cats were staring at her. She briefly wondered if she had something on her fur, or if her bows were lopsided, but she quickly dismissed both ideas. She opened her mouth to speak but the waitress interrupted her by placing a roll in front of Si and Am. She stared at it in confusion for a moment before Yen Sid spoke up. Vanellope isn't sure what to think about the roll placed in front of her. She's never seen anything like it, but she is willing to give it a try. She takes a bit out of it and grimaces. She does end up swallowing it instead of spitting it out, but with some difficulty. Good thing I've already had lunch she thinks to herself. Maybe she'll at least get some desert. According to Mater, that thing called wasabi looks like pistachio ice cream, but tastes like it's turned. Vanellope didn't know what turned meant, but she figured it'd just be safer to ask the waiter for a desert menu. Vanellope suddenly hears Yensid speak up; something about a roll. She looks up and notices that an extra roll has been placed in front of the two trouble making cats. Si and Am are served their meal. The see an extra roll. "finally" started Si, "but why the rice" questioned Am. "does orange" starts Si, "taste better than blue?" finished Am. "Hungry", they say in unison. As Mater is talking to Vanellope about the wasabi, he notices that she might not know what "turned" meant, but before he could explain it to her the waiter places a unique roll in front of the twin cats. Mater notices that it looks familiar but does not give it much thought. As he is taking a sip of his water,and when Yensid makes a comment and he realizes that its another one of those talking fish. Mater spits out his water, completely soaking the big cat with a scar on his face, much to the cat's dismay. Mater to Scar: "Oops, sorry, my bad!" He turns to Vanellope and whispers: "Now, is that the father or the son fish?" He continues with a grim face, "Thats NOT funny right there!" "You old rust bucket....watch what your doing." *Scar pops out his claws and shows them to the tow truck. * "These can do alot of damage to those tires of yours." Vanellope takes a better look at the sushi roll and notices something. It's another one of the talking fish, like Dory. Mater turns to her and asks if it's the father or the son. After getting a good look at the sushi, she thinks it might be the dad. "I think it might be Marlin," she replies, trying not to look at it too long. Whoever was doing this was a sick individual. I mean really, killing someone then serving them to the detectives! Vanellope thought to herself who the killer could be, and whose body they might find next. She shudders at the thought. 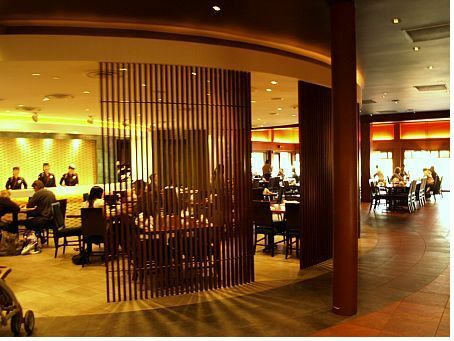 *Ursula finally arrives at the Tokyo restaurant, allowing the hostess to take her to the table. Sitting herself besides Scar, the sea witch takes in the present group and notices the lack of a certain Dentist(good riddence). The duo of intelligent, sly looking, cats offer the "oh so adorably cute it could kill" kitten a small morsel of their sushi. Noticing the kitten's reluctance, she offers herself the piece of fish, let no food go unwasted as her mother always told her. "Don't mind if I try, mmm...."
OOC: Information is coming soon, check your inboxes. OOC: I love the interaction I'm seeing at the restaurant, please keep it up! Marie gulped when the two cats offered her the fish's head. She didn't like her food looking so... alive. She couldn't help but feel relieved when the sea witch snatched it away instead. Marie chirped her happiness and smiled politely at Si and Am. Just then the pink cat returned. He rambled on about about fish, but as usual his riddles left Marie in confusion. Yen Sid even seemed to puzzled. Marie thinks the cat had asked him a question.